We were appointed to work with Lewisham Healthcare NHS Trust as they approached a pivotal point in their history – a controversial enforced merger with Queen Elizabeth Hospital in Woolwich. 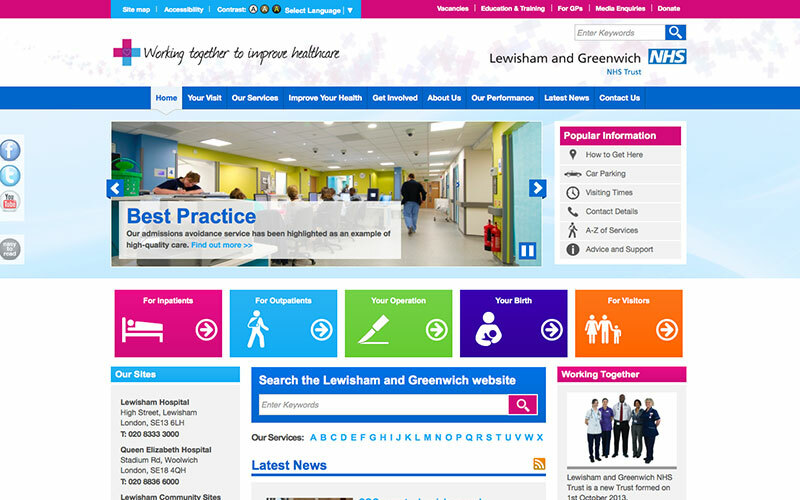 At the point WDAD were awarded the contract, the local community were mounting a vigorous campaign to stave off the cuts and morale amongst employees at Lewisham was poor. WDAD presented a strategy that initially focused on engaging with existing employees to explain more about the potential benefits of the merger and reassure people of the future. Working on a monthly retainer, the agency also created a visual identity for the new organisation (launched in Oct 2013), including a short animated video, interim recruitment web page, posters, advertising style and promotional items. Once the new Trust had been unveiled in Oct 2013, the agency designed the new recruitment web pages and assisted on day-to-day recruitment campaigns, ensuring that all recruitment content adhered to the agreed brand fundamentals. In the Spring of 2013 a Culture Review was undertaken by a specialist organisation – Loop2 – providing a bench mark for our 1st phase work. Overall it confirmed that strong progress had been made in changing the perception of the Trust as an employer (pre-merger). Now that the new Trust has been launched, our work has been recognised by the PPMA (Public Sector People Managers’ Association), with WDAD the proud recipients of their Best Resourcing Provider accolade at the Recruitment Marketing awards in May 2014.